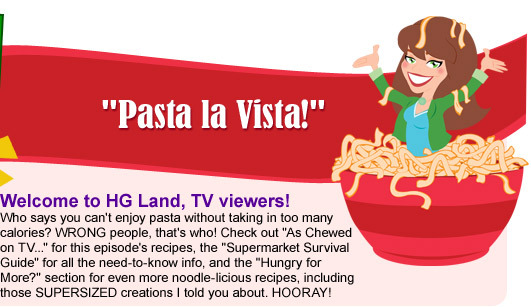 home > episodes > Pasta la Vista! It's creamy, cheesy, decadent, and delicious, and it has only 99 calories. Holy macaroni! Unconventional? Sure. But broccoli cole slaw in garlicky tomato sauce with lots of Parm will obliterate your spaghetti cravings! Your bowl of spinach fettuccine is about to get a whole lot larger for not a lot of calories! Fans of authentic spaghetti will LOVE this ginormous serving of noodle-y goodness! 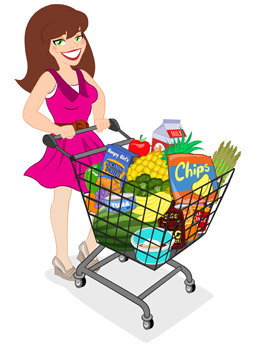 Supermarket Survival Guide (Tips & Picks)! Marinara Sauce - The most important thing to know? Always check the nutritional label -- some sauces have WAY more fat than you'd suspect. Look for kinds with 60 - 70 calories and 3g fat or less per 1/2-cup serving. Another great option? The ever-versatile HG staple that is creamy low-fat tomato soup -- Amy's Chunky Tomato Bisque is perfect. Cheese Sauce Essentials - Fattening jarred Alfredos? NO WAY! Pick up The Laughing Cow Light cheese wedges (click here for the full 411! ), fat-free sour cream, and reduced-fat Parmesan-style grated topping. Mix and melt for guilt-free "Girlfredo" sauce. Another option? Head to the freezer aisle for frozen veggies with cheese sauce, like the kinds by Green Giant. Tossed with pasta (like in THIS recipe), that cheese sauce goes a long way, and the veggies fill out your pasta bowl! Noodles - My #1 noodle swap? HOUSE FOODS TOFU SHIRATAKI! It comes in a variety of pasta shapes, and a 2-serving bag has a mere 40 calories! Find it at select markets near the tofu in the fridge section. For something a little more mainstream, go for whole-wheat pasta with about 6g fiber per serving. Sprayable Salad Dressings - Wanna get crazy? Use spray dressings like the kinds by Wish-Bone and Ken's as a quickie topping. It takes pasta salad to a whole new level! Supersized Recipe! 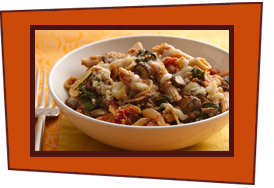 EZ Cheesy Lasagna for Two - Eggplant slices make this recipe a TOTAL calorie bargain! Simply the Pesto Spaghetti - This typically oily meal got the HG treatment BIGTIME. You've gotta try this basil-icious noodle dish! Supersized Recipe! Creamy Dreamy Macaroni Salad - Bell peppers and celery bulk up your mac salad, and they taste delicious in the creamy sauce! Spicy EZ Mac 'n Cheesy - A twist on our regular mac & cheese, this stuff has fun Mexican flavors along with all that cheesy goodness. Super-Delicious Shrimp Scampi with Fettuccine - Another conventionally heavy dish, devoid of the usual boatload of butter. Chicken Carbonara a la Hungry Girl - Quit blinking your eyes... It's true! We have this creamy, eggy, bacon-packed pasta dish slimmed down and ready for you. Super-Duper Spaghetti Pie Part Deux - This dish is a little unique and a LOT filling. Seriously tasty stuff, people!